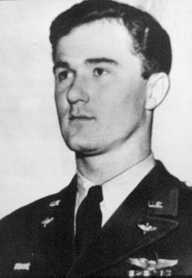 January 7, 1948, would be a day of tragedy for Captain Thomas F. Mantell of the Kentucky Air National Guard, and his family, friends, and fellow Guardsmen. The Mantell case will forever be an important part of the hotbed of UFO reports of the late 1940's and early 1950's. He would have the unfortunate distinction of being the first human being to give his life in the ongoing chase for the elusive truth behind bizarre reports of flying craft from other worlds. Was his sighting a carry-over from the foo-fighters of World War II? or were they altogether another phenomena?... a phenomena that was just out of his reach. He gave all he had to reach this mysterious, intelligently controlled metallic craft, but whatever it was, and whoever controlled it, escaped that day... the day that Thomas Mantell lost his life. Mantell was piloting an F-51 that fateful day, soaring to Standiford Air Force Base, Kentucky. He was accompanied by three other Guard planes. At approximately 1:30 PM, the Kentucky State Police began receiving reports from worried citizens of spotting a large circular object flying over the city of Mansville. In a matter of minutes the area of the sightings expanded to cover Irvington and Owensboro. This large, metallic flying craft was then clearly seen from the tower of Godman Air Force Base. The object was described as being an extremely large, round, whitish in color, with a red light toward its bottom side, and seemed to be moving slowly toward the South. A little over an hour after the first reports, Mantell's group was asked to investigate the anomalous object. 18,000, 20,000, 22,000 feet! too high for the WWII fighters without oxygen! The other two planes turned back, leaving Mantell alone to pursue the giant object. By all accounts, Mantell must have passed out from lack of oxygen at about 30,000 feet, at least his plane leveled off at that height. His plane now began to plunge back toward earth. He crashed a few harrowing moments later on the farm of William J. Phillips near Franklin, Kentucky. Mantell's watch stopped at 3:16 PM, and his body was still strapped in his plane, which become his coffin. He had spent 45 minutes in a frantic flight into the realm of the unknown. By 3:50 PM, the giant craft was not visible from Godman, but reports continued as the UFO continued southward into Tennessee. The reports of the incident spread like wildfire. Theory and speculation reached radio shows, television, and newspapers. The New York Times' story began with this headline, "Flier Dies Chasing A Flying Saucer," and another story was headlined with, "Plane Exploded Over Kentucky as That and Near States Report Strange Object." Common speculation that Mantell was chasing a UFO was countered by the Air Force, which initially concluded that Mantell and his cohorts were chasing the planet Venus. They also announced that his death was directly related to oxygen deprivation. This almost comical conclusion was hastily put to rest by an eyewitness, Glen Mays, who lived near Franklin. Mays stated categorically that Mantell's plane exploded in midair." The plane circled three times, like the pilot didn't know where he was going," reported Mays, and then started down into a dive from about 20,000 feet." "About halfway down, there was a terrific explosion." Also, there is the testimony of Godman Base Commander Guy F. Hix, who stated to reporters that he observed the craft for almost an hour through binoculars. He would not have confused what he saw with the planet Venus. Richard T. Miller, who was in the Operations Room of Scott Air Force Base in Belleville, Illinois also made several profound statements regarding the crash. He was monitoring the radio talk between Mantell and Godman tower, and heard this statement very clearly. "My God, I see people in this thing!" Miller added that on the morning after the crash, at a briefing, investigators had stated that Mantell died "pursuing an intelligently controlled unidentified flying object." In conclusion, Miller made this statement... "That evening, Air Technical Intelligence Center officers from Wright-Patterson AFB arrived and ordered all personnel to turn over any materials relating to the crash. Then, after we had turned it over to them, they said they had already completed the investigation. "I was no longer a skeptic. I had been up to that time. Now I wondered why the Government had gone to all of the trouble of covering it up, to keep it away from the press and the public." In more recent years, additional information has come forward. Captain James F. Duesler, who was one of several military officers at Godman, was retired and living in England. In 1997, he stated that he and several other officers actually saw the gigantic UFO hovering over Godman field that day. Duesler, who was a pilot and crash investigator, stated, "The UFO was a strange, gray-looking object, which looked like a rotating inverted ice cream cone." 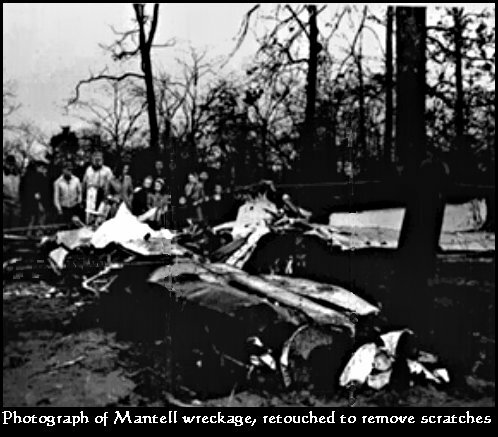 Shortly after the crash, Duesler visited the site, and made these observations, "The wings and tail section had broken off on impact with the ground, and were a short distance from the plane, he recalled. There was no damage to the surrounding trees and it was obvious that there had been no forward or sideways motion when the plane had come down. It just appeared to have "belly flopped" into the clearing. "There was very little damaged to the fuselage, which was in one piece, and no signs of blood whatsoever in the cockpit. "There was no scratching on the body of the fuselage to indicate any forward movement and the propeller blade bore no telltale scratch marks to show it had been rotating at the time of impact, and one blade had been embedded into the ground. "The damage pattern was not consistent with an aircraft of this type crashing at high speed into the ground. Because of the large engine in the nose of the plane, it would come down nose first and hit the ground at an angle. Even if it had managed to glide in, it would have cut a swath through the trees and a channel into the ground. None of these signs were present. "All indications were that it had just belly-flopped into the clearing. I must admit, I found this very strange." To further debunk the "Venus" theory, astronomical records indicated that the planet was only 33 degrees above the horizon at the time of the incident, thus totally eliminating it from the case. The Air Force, embarrassed by the "Venus" theory falling through, now searched for another "worldly" explanation for the object observed that day. After discovering that Naval research was sending up the enormous "Skyhook" balloons, the Air Force had their alternate solution. This theory was also soon aborted after discovering that no balloon was launched, or could have been in the skies that day. The UFO theory received even more credence after Mantell's death. On January 8, residents of Clinton, North Carolina, reported a cone-shaped object moving through the skies at incredible speeds, and on February 1, a large metallic UFO was seen emitting an orange light near the ground at Circleville, Ohio. Whatever happened on the day that Thomas Mantell crashed his plane, it is certain that it was not a weather balloon, and it was not Venus, or any other planet. Could it have been a visitor from another planet, or another dimension? See 7 official documents relating to the Mantell case HERE. "Captain Tom Mantell's Last Words." C.R.I.F.O. Newsletter 1,9 (December 3, 1954):4. Crain, T. Scott, Jr. "A Mantell Diary", MUFON UFO Journal 217 (May 1986): 9-13,17. Gillmor, Daniel S., ed. Scientific Study of Unidentified Flying Objects. NewYork: Bantam Books, 1969. Gross, Loren E. UFOs: A History - Volume 1: July 1947-December 1948. Scotia, NY: Arcturus Book Service, 1982. Jones, William E. "Historical Notes: Thomas Mantell." MUFON UFO Journal 264 (April 1990): 18-19. Keyhoe, Donald. The Flying Saucers Are Real. New York: Fawcett Publications, 1950a. Keyhoe, Donald The Flying Saucers Are Real." True (January 1950b): 11-13,83-87.